Merfolk Planeswalker Kiora came to Theros during the events of Theros block and the novel Godsend. She was—and is—on a quest to find the greatest denizens of the seas of many worlds. Kiora hopes to return to her native Zendikar and fight against the world-devouring creatures called the Eldrazi with the help of her summoned allies. But she will not return until she has found a weapon worthy of the fight. Kiora arrived on Theros during the Silence, a time when the gods of Theros were magically barred from interfering in the mortal world. 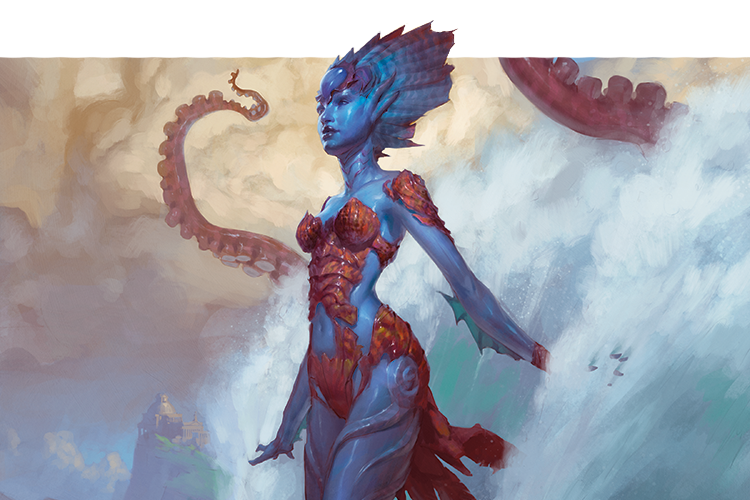 She took full advantage of this circumstance, posing first as an avatar of the sea god Thassa, then as the mythic rareal navigator Callaphe. The native merfolk, called tritons, were desperate for any sign of their god's return, and many of them embraced Kiora's claims. Elspeth Tirel and Ajani Goldmane, meanwhile, sought to journey into Nyx to stop the ascended Planeswalker-god Xenagos. They recovered Callaphe's ship, the Monsoon, but they needed a navigator. "Callaphe" soon arrived, and the trio set out for Kruphix's temple at the edge of the world. Like Callaphe herself, however, their journey was not what it seemed. 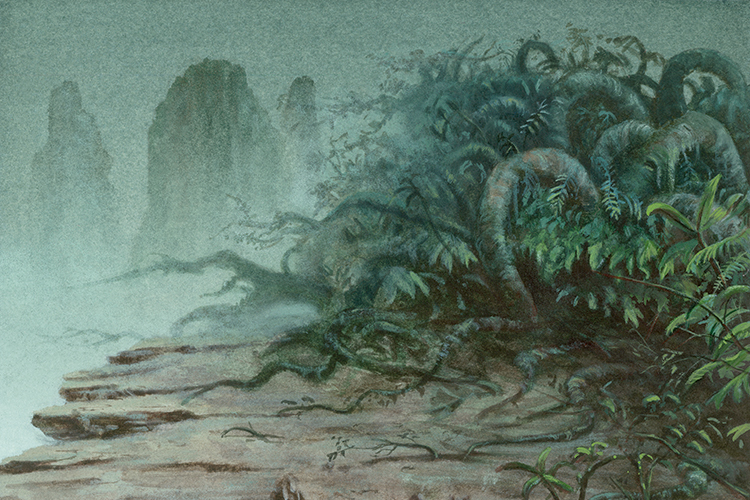 The Monsoon was a living creature, and it—not Kiora—knew the way to the edge of the world. Kiora had a different destination in mind, and instead urged the Monsoon to take them to the legendary lost city of Arixmethes—which she knew was not a place, but a massive living creature with an entire city built upon it. The novel Godsend followed Elspeth and Ajani's path into Nyx, leaving Kiora's tale behind. When we last saw Kiora, she was locked in combat with Thassa herself, and the outcome of that battle has been unknown—until now. Kiora's heart pounded as the prow of the Monsoon came to rest at the edge of a vast and ruined city. The surface did a fine impression of land, if you didn't look too hard, but it was too dark, too rubbery. She frowned at the ornate buildings dripping seawater, clinging to this great curved surface like barnacles. How could anyone mistake the great kraken Arixmethes for an island? The human, Elspeth, asked something about Kruphix's temple, and the cat-man answered her, but Kiora wasn't listening. Finally! "Welcome to Arixmethes!" she cried, leaping off the ship and onto the soft, pliable surface. "The sunken ruins! At last, I've found him." "Him?" asked Elspeth. They still didn't understand. But she and the leonin, Ajani, stayed on the Monsoon just the same. "You're not Callaphe, are you?" asked Ajani. "Not even close," Kiora replied, smiling back at him. The cat-man had suspected all along she wasn't who she said she was, but he'd come aboard the Monsoon anyway because she had something he wanted. They'd used her to get to Nyx, and she'd used them to get to Arixmethes. Now she was here, and they could take the Monsoon and go and get themselves killed. It was like a trade. Everyone got what they wanted. Behind them, the waves became turbulent, and there was a rushing sound deep below the surface. Well…not everyone. Best hurry, then. "Who are you?" Ajani asked. "You can call me Kiora," she said. She didn't bother mentioning that she was a Planeswalker; he clearly knew. And Elspeth was hardly a Theran name. So she hadn't been the only one concealing her identity, had she? "I needed the Monsoon to find Arixmethes. I couldn't have done it without you. Good luck getting to Nyx." "But where is the edge of the world?" Elspeth asked. "Ask the ship," said Kiora, over her shoulder. Thassa was close. Arixmethes would wait, and she no longer needed the drywalkers. What she needed were allies. Kiora cast a spell to aid her swimming, and her arms grew longer with a cracking sound as she dove beneath the waves. The last thing she saw before the water closed around her was the Great Eye—the sea god Thassa in one of her many guises—bursting out of the water, fixing its terrible gaze first on her, then on the two drywalkers. Elspeth, the Betrayer, so people called her. Kiora had never caught the exact details of her crime—you don't get to ask many questions when you're posing as a god—but hopefully Elspeth's presence would draw Thassa's ire long enough for Kiora to prepare. She dove straight down, down and down, her elongated body propelling her through the water. It grew darker, and colder, and more silent. The pressure became immense, the water flowing through her gills shockingly cold. She could feel great shapes moving around her, but saw nothing—the darkness was total. Just when she thought she would have to turn back, her palm came to rest on the cold and silent surface of the sea bed. She paused, upside-down, and for a disorienting moment imagined that she was hanging from the ceiling of the depths, dangling precariously above thousands of feet of water and the hard, unyielding surface of the sea. She smiled and began a spell. She sent a pulse of power outward, calling to the enormous animals she could feel moving all around her. These were the creatures she hadn't found on her arrival—the true colossi of the deep, the ones Thassa kept out in the deep ocean—like cattle, or tuna. But now she'd found them. She was in Thassa's secret seas, and the god herself, though nearby, was distracted. Hear me, Kiora told the krakens and leviathans. Heed me. I am not your master. But I will set you free. They stirred in the depths around her, waking from their slumber. Spots of bioluminescence winked on and slowly brightened, bathing the murky depths in eerie greens and blues. Plates of chitin scraped together, claws snapped, and long, sleek bodies uncoiled. They were listening. But that? That was the easy part. Reaching out across the Blind Eternities, she gathered to her the essence of every sea-beast she had ever called her own. She pulled those essences to her one by one, manifested them in Theros's seas. The strain was immense. New shapes dove out of the darkness, and grating squeals and clicking rumbles sounded challenge. The newcomers and the natives circled and snapped, investigating, testing each other, trying to work out a pecking order. Good. You've slept too long, Kiora thought at them. You are awake. You are hungry. You are mine. Upward, to feed! They surged around her, eager, a hurricane of flesh and chitin. She grabbed the spines of a passing serpent, one with a long, straight horn, and nestled against its back for the climb to the surface. Not one of Thassa's, just in case that proved important. No need to spend any more of her own strength when these fabulous creatures had so much to spare. Kiora no longer knew whom to pray to for good fortune. 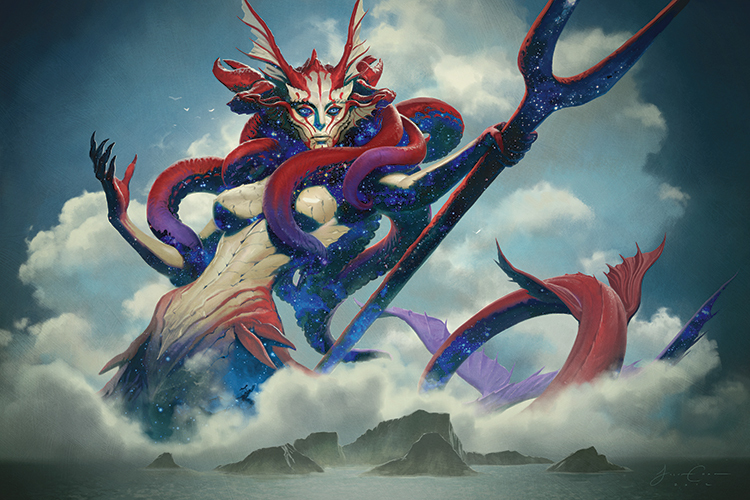 For many years she had prayed, in secret, to Cosi, the trickster god of Zendikar's merfolk. She'd never thought of herself as a trickster, a devoted member of Cosi's cult, but she'd prayed to him. And she silently scorned the devout worshipers of those useless figureheads Emeria and Ula. How little she had known! The gods were not gods, and the deceiver Cosi was revealed, with horrific irony, as a sham—a twisted memory of the Eldrazi titan Kozilek, passed down in an idiot's game of whispers. Emeria and Ula, likewise, proved monstrous and deceitful; Cosi, at least, had never pretended to virtue. Perhaps that was why she no longer feared gods, why she had steered this course in direct opposition to an angry deity of the sea. Praying to the gods, she reasoned, was for people who had never fought one. The sea grew lighter around her, and at last she could see the armada she had assembled, massive creatures from a dozen worlds swimming together with the precision of a school of fish. They broke the surface in a boiling mass, and Kiora whooped from the back of her serpent. In the distance, she saw Thassa, in triton form, standing on the deck of the Monsoon. She bristled—even if she no longer needed the ship, even if she was happy to let Elspeth and Ajani ride it to the edge of the world, she'd be damned if she'd let Thassa have it. She willed a black, barnacled, titanic squid to surface next to the ship. The Monsoon pitched and rolled in agitation. Arixmethes had had enough jostling from the lesser leviathans, and dove beneath the waves. No matter. She would find him. But she had to deal with Thassa first. 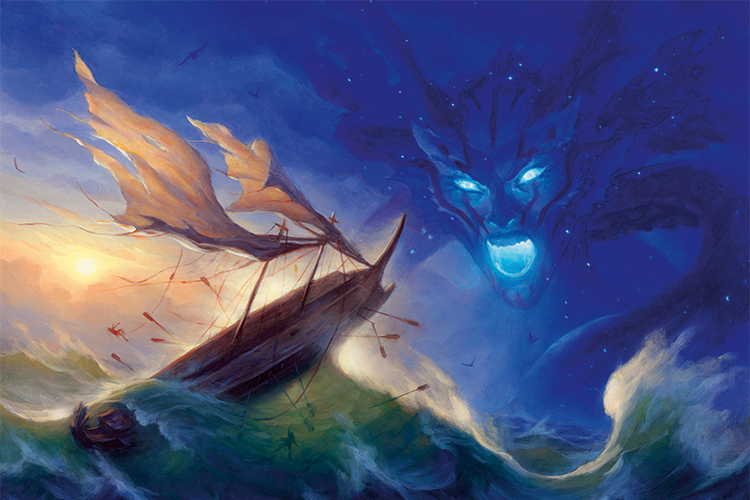 Thassa stepped off the deck of the Monsoon, and a great wave vaulted the ship-serpent skyward, with Elspeth and Ajani clinging to it. Apparently they'd convinced Thassa to aid them, or at least to send them away. Kiora hoped they made it. They seemed alright, for drywalkers. And as far as she could tell, their mission was a worthwhile one. She waved a quick goodbye as they vanished into the sky and the great wave carried them away. Thassa transformed back into the Great Eye in midair and floated toward Kiora over the water. Water swirled around her as she shifted between shapes—the Eye, a waterspout, a flock of seabirds, and finally her triton form, holding the bident that was her signature weapon and her power over the sea. This…was going to be tough. The sea boiled. 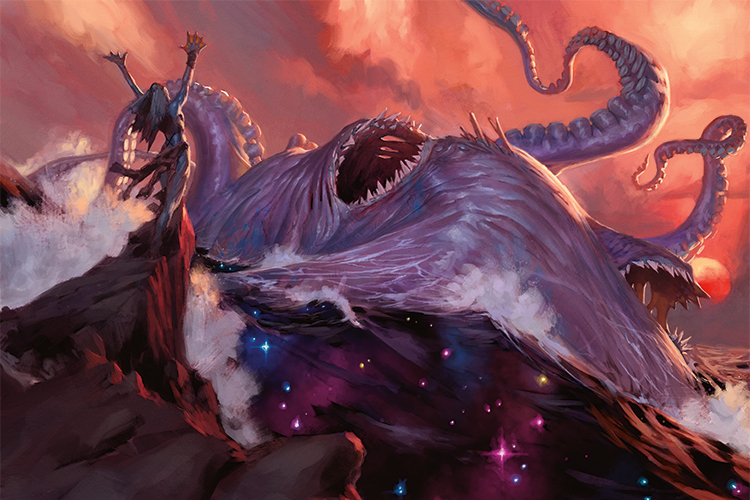 More krakens emerged, propelled from seas all over Theros, answering Thassa's call. In the distance, Arixmethes himself breached the water, his black bulk both beautifully sleek and impossibly massive. Even the largest of the other krakens were minnows beside him. 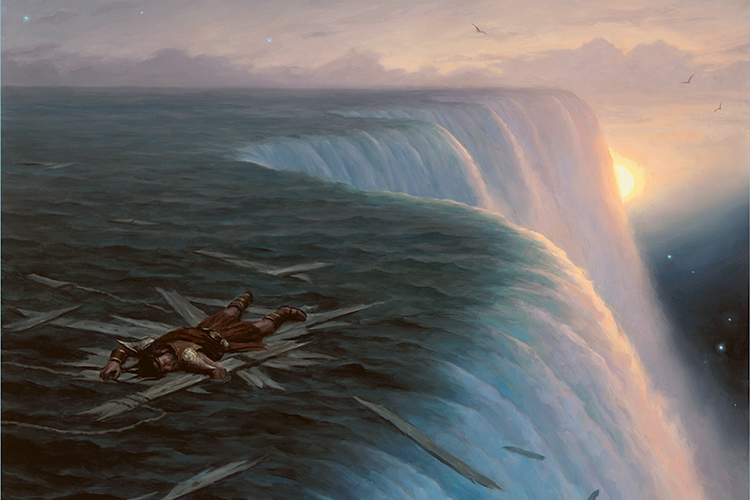 He crashed back down, and the sea shuddered. He was perfect. He was also, for the moment, on Thassa's side. "You'll never claim Arixmethes!" cried Thassa. She called her titans to her, and Thassa did the same. Thassa had far greater command of the sea itself, so Kiora focused on keeping her own little patch of it stable and let the sea god come to her. She arrayed her krakens around her. Thassa and her attendants rose up on a great wave, Thassa's bident pointed straight at Kiora. A tide of saltwater and flesh crashed into Kiora's army. The serpent Kiora was riding bucked and twisted, snapping at a massive octopus that wrapped strong, slimy tentacles around it. It bit ragged holes in the octopus's body, and the enormous creature fell away into the surf. 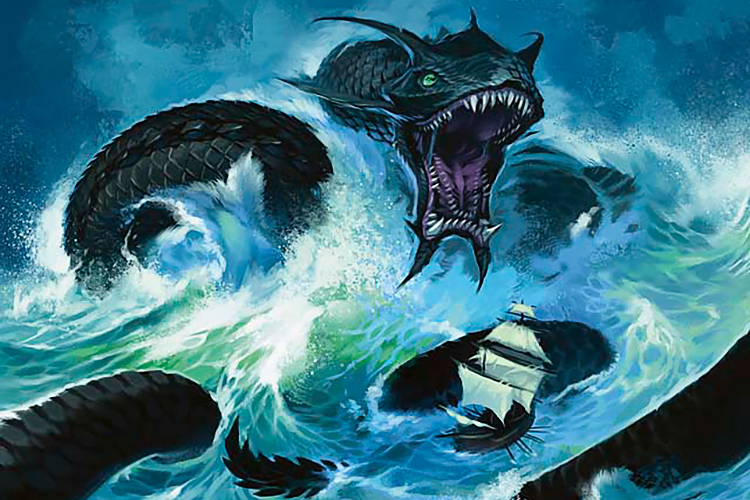 Distantly, on the edge of the tangle of thrashing serpents, Kiora saw heads pop out of the water—tens, then hundreds. Tritons! How had they come all this way? "Welcome, my children!" bellowed Thassa, in a voice that shook Kiora's bones. "Bear witness to the fall of the pretender!" She'd brought them, used no small amount of her strength to pull them through the sea, just so they could see her fight Kiora. Was that just pride? Or was it…need? "You're making an example of me?" yelled Kiora, trusting that the god of the sea itself could hear her through the waves, if not over them. "What's the matter? Has their faith in you flagged so much?" "I will grind you into sand," said Thassa, a voice simmering out of the ocean itself. Did she need their belief? Had Kiora taken that from her? Was that what this was about? If Kiora's little charade on her way to Arixmethes had actually weakened Thassa for their fight…how delicious that would be! Kiora's serpent surged forward through the crush of enormous bodies and choking tentacles, pointed not toward Thassa, but toward Arixmethes. Thassa had to defeat her in order to win. Kiora just had to form a bond with that kraken. She gripped the serpent tightly, trying to balance between lending strength to her forces and saving her own for what was to come. The serpent thrashed and twisted, sometimes swimming along the surface like a river-snake, sometimes diving below, even leaping out of the water—anything to get through. And she was getting through. Thassa had all the krakens of Theros, minus the few that Kiora had suborned. But Kiora had titans from a dozen worlds, things that Thassa had never seen, never even imagined. Many of them were larger than Thassa's largest children, save Arixmethes. Slowly it dawned on her: she was winning. Arixmethes tore his way through the fray, biting Kiora's off-world krakens in half or swallowing them whole, and simply pushing the krakens she had taken from Thassa to one side. He was inexorable, impossible. He was at least as big as Kozilek. Thassa rode atop Arixmethes without holding on, bident in one hand, staying effortlessly on his back as he pushed his way through. Kiora's little serpent, a hundred feet long, was dwarfed before him. Thassa smiled. "Now you will learn," she said, in that same amplified voice, "what it is to defy me." "Happy to teach your followers how it's done!" yelled Kiora. This was it. Kiora stretched out her hand and poured every ounce of strength she had into Arixmethes's ancient, languid thoughts. She felt her other krakens begin to flag, saw a few of them go over to Thassa's side. That didn't matter. Nothing else mattered. Nothing but him. He opened his enormous mouth, big enough to swallow her and her serpent in one bite. She and Thassa were as close as they'd ever been, perhaps a hundred yards apart, and whether through magic or divinity or just an overactive imagination, Kiora could make out every detail of the fury on the god's face. She wouldn't normally try to wrest an animal away from the one who commanded them. It wasn't really her specialty. What she was doing wasn't truly mind magic, more like…instinct magic. And she knew the instincts of the sea better than any others. You are not mine, she thought at him. You are not Thassa's. You are your own. And I need your help. Will you come when I call? His great mouth closed again, and for a moment she dared hope. Come to me, she willed him. I need to get the sense of you. Nothing happened. The melee around them grew quieter, too many of Kiora's allies killed or brought over to Thassa's command. Come on. "You poor fool," boomed Thassa. "You truly thought to steal a kraken from the god of the sea?" "No!" cried Kiora. But the serpent she rode was no longer hers to command. She could only watch as the serpent scooped up a mouthful of screaming tritons, devouring dozens in one bite. "You see?" boomed Thassa. "She does not care for you! She cannot harm me, so she lashes out at my faithful." Behind Kiora, half her krakens had turned against her, even those from other worlds. Thassa raised the bident and sent a great wave crashing toward Kiora and her serpent, to whelm them and "protect" her followers. The serpent reared back above the water as the wave sped toward them. Thassa was going to let it take another mouthful of her own followers before the wave hit, just to prove a point. Kiora shook with fury. She pushed her hands against the serpent's great back and willed away, banished it back to the Æther from which it came. She sent more of her krakens with it, the ones that had turned against her. The great body beneath her vanished in a shimmer of turquoise light, and Kiora plunged toward the ocean like a stone, stretching her body out to turn an awkward fall into a smooth dive. The water began, horribly, to recede. Thassa's bident glowed brightly as she pushed back the sea in a great bowl, somewhere between a whirlpool and an arena. The remaining krakens were pushed outside the growing well of water, swirling around, and Thassa's followers became an audience arrayed around a sloping, circular wall of water. "The price of treachery!" cried Thassa. And now her followers cheered her. Kiora fell. She spread her body out, no longer diving but falling. She couldn't feel her army. Thassa had bested them, driven them off, or taken them from her. Arixmethes receded into the deep. Below Kiora, the well of air opened onto the blank and pitiless bottom of the sea. She didn't think Thassa was going to let her hit the sea floor—the sea god clearly meant to make a show of it—but she wasn't taking any chances. She reached out with her magic to the newly exposed sea bottom, and did something Thassa couldn't: she pulled roots and vines up out of ground that had never seen the sun, a rush of new growth snapping and creaking to life. She closed her eyes, tucked into a ball, and slammed into the cushion of greenery at high speed, coming to rest upside-down in a tangle of vines just a few feet above the slimy earth. She smiled. She was alive, at least. That was a good start. Before she could free herself from the vines, a wave of grasping hands made of sea foam rushed through her little forest, tearing the still-green branches apart, ripping the vines, and pulling her out of the greenery. The hands of water deposited her on her knees on the sea-bottom, Thassa's arena towering around her. Behind her, the wall of water surged forward over her forest, drowning it. She stood up, arms and legs covered in gray, oozing mud. The water behind formed a sheer wall, rushing by so quickly she couldn't see through it. Around her rose flat-sided boulders like the teeth of some great serpent, although she was fairly sure they weren't. Thassa's arena had become an amphitheater. Along the sloping wall opposite, Thassa descended, gliding down on a pristine wave. The tritons gathered around their god, sticking out of the wall of seawater in a mass of silent, disapproving faces. "You led my people astray," said Thassa, her voice echoing across the expanse of seafloor. "You stole my children. You besmirched the name of my devotee Callaphe and aided Elspeth, the Betrayer in her quest." So did you! thought Kiora, but she didn't bother saying it. Her army was gone. Arixmethes had returned to the depths. She'd had high hopes. But this fight was over. She dove for the wall of rushing water, hoping to get away long enough to planeswalk. Thassa threw her bident, and it sailed through the air with astonishing speed, shrinking as it flew toward her. Kiora twisted in the air, but the bident followed her movement. 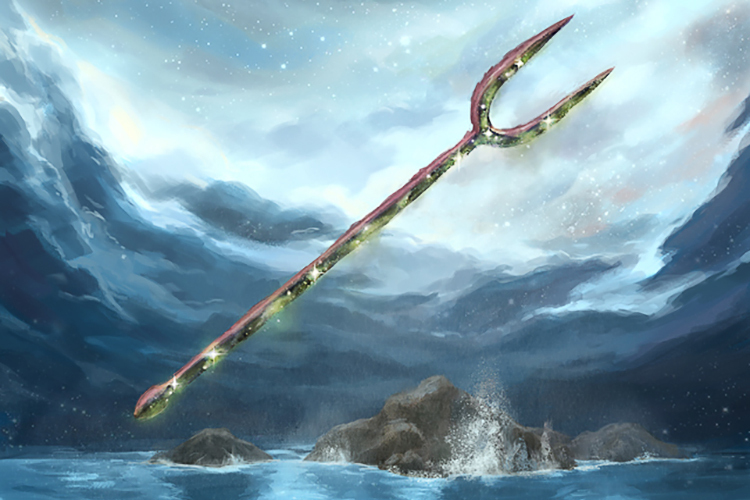 It slammed into her and pinned her to one of the boulders that littered the sea floor, its prongs fitting snugly around her neck. She lay against the boulder, dazed, the coral-like surface of the bident pressing into her throat. "Pathetic," said Thassa, her feet coming to rest on a carpet of clean water that flowed before her over the oozing muck. Kiora wrapped her hands around the bident's handle and pulled, but it held fast. She choked and struggled, then went limp. She began to gather mana for one last, desperate spell, and tried to keep Thassa talking. "You're right," she wheezed. She heard her own voice carried out over the seabed to the assembled tritons. "I was a fool to think I could defeat you." "Oh, how kind of you to say!" laughed Thassa. She walked toward Kiora, the carpet of seawater expanding in front of her so her divine feet never touched the slimy sea bottom. "A simple triton is willing to grant that it was ill-advised to anger the god of the seas, who commands every ocean under Nyx!" "There are more oceans than you know," said Kiora. Thassa frowned and gestured, and the bident drove further into the rock. Kiora choked and fell silent. Thassa was close to Kiora now, leaning down, and she spoke for Kiora alone in a voice as cool and mirthless as an ice floe. "What is that supposed to mean?" she asked. "Thh—" said Kiora. Her vision swam. "Thhhh—"
Thassa moved one hand dismissively, and the bident's grip on Kiora's throat loosened. Kiora kept her hands wrapped tightly around its handle. "For what?" asked Thassa. "The lesson in humility?" Kiora's silent, desperate spell reached its climax. "The bident," she hissed, and melted away into the void, Thassa's weapon still clutched in her hands. The last thing she heard before she slipped between worlds was the anguished cry of an angry god. In the space beyond space, Kiora clutched her stolen prize and laughed.